Casey’s relaxing Caribbean jazz cruise is interrupted when “The Countess” goes missing and the captain asks her to investigate … quietly. All Casey wanted was to sit on the deck reading novels and possibly pursue her attraction to Aaron, an intriguing jazz magazine editor. 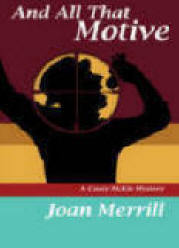 But she can’t resist a mystery, especially when homicide might be involved. Ship authorities believe the countess simply overstayed an island stop, but Casey suspects something a bit more sinister. Images of the countess flailing in the night sea haunt Casey as she uncovers several passengers with motives for murder. The tenacious PI follows clues stretching from the seedy underbelly of Saigon to the luxurious ports of the Caribbean, the mystery’s final resolution stunning even the seasoned investigator. 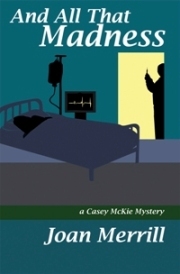 "Joan Merrill's lead character, private investigator Casey McKie, returns in a sequel to And All That Murder (reviewed January 2011). This time, Casey is taking a vacation aboard a jazz cruise ship in the Caribbean. Her good friend, jazz singer Dee Jefferson, is one of the star attractions and other performers include up and coming jazzmen alongside veterans of the long ago King Basington band. The disappearance of a mysterious and very rich jazz-loving countess has the ship's captain seeking Casey's help in finding out just what is going on without alarming the other passengers. Casey is only too happy to oblige and soon discovers that many of those on board, jazz fans and jazz musicians, have secrets. As in her previous book, Merrill brings a sharp-eyed insider's attention to the jazz world. The King Basington band bears more than a passing resemblance to the Count Basie band and the fictional veterans on board will spark individual memories of real stars of yesteryear in many jazz-minded readers." 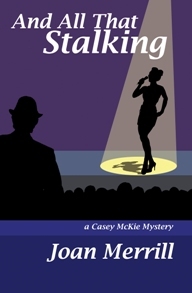 Audio book of And All That Stalking is in production.